Taikijyuku is a direct follower of Nippon Koden Fushi Muso Kai, which carries on the traditions of the bushido culture of ancient Japan. Nippon Koden Fushi Muso Kai hands down a variety of traditional martial arts including some that were established as long ago as the period of the Northern and Southern Dynasties in the 14th century. 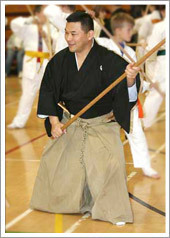 A broad array of these arts is taught in training including iaido, kenjutsu, bojutsu (and hanbojutsu), suemonogiri, shurikenjutsu, naginatajutsu and jujutsu. Taikijyuku’s mission is to make widely known Japan’s valuable traditional martial arts and unique culture, which are being handed down by Nippon Koden Fushi Muso Kai, and to help pass them on to posterity so that they do not die out with the present generation. 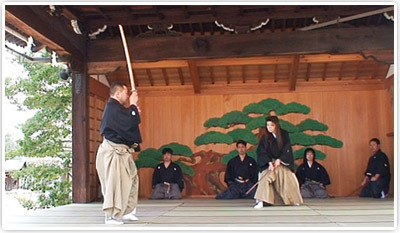 The martial arts taught by Taikijyuku are based on samurai culture and maintain a strong focus on spirituality of the Japanese. In this sense they differ fundamentally in intent from other contemporary martial arts or combat sports that have become essentially sporting contests based on points to determine winners and losers. Learning and exercising these time-proven martial arts offers a way of acquiring the spiritual culture, history, manners and ways of thinking of the samurai, which also helps contemporary people contemplate ways of life and attitudes of the mind. Exercising, working up a sweat and learning how to breathe through training also enhances the practitioner’s spiritual as well as physical health, leading to the nurturing of their humanity. Jujutsu, which does not involve the use of weapons, is also taught as a means of facilitating mastery of the art of self-defense. 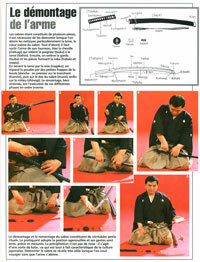 A French magazine article on Shihan explaining how to take care of swords.